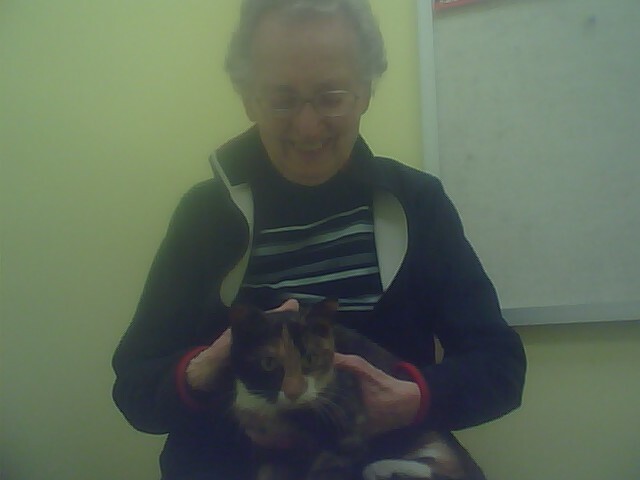 Anyways, yesterday, just for fun, Liz and Mema went to the SPCA to look at cats and hold some. They came across this one cat, Mariam. She was about 7 months old, so still classified as a kitten. Liz emailed me some pictures from her phone of Mariam and told me that she was a sweetie and was just soaking up the love. :) They spent some time there with her and then came home. I got done with work and Liz talked me into driving back to the SPCA to see Mariam. I'm a sucker for cats, so we did! We went down and saw Mariam. She was in the last cage in the hallway, way in the back...poor thing. We got to her cage and she was really shy. Liz was able to coax her out and into her arms, to the tune of immediate purrs and kneading on Liz's shirt. :-) I could tell that Mariam was a sweetie. She seemed really timid, and really in need of love. Most of the cats there seemed either 1) content with themselves, 2) full of themselves, or 3) lazy and uninterested in anything. But, Mariam seemed different. She was shy, but quiet and needing affection. She seemed like maybe a good match for Shadow. Liz said that Mariam hadn't said a single word the whole time she was with her earlier today! What a quiet kitty! So, Mariam was there on Liz's shoulder chillin', but then started climbing up her some. Liz pulled her away, but then realized that Mariam was bleeding from her underside! Mariam had been spayed not too long ago, but should have been healing by now. Liz had to put her back in the cage because there was already blood on her shirt. When Mariam was back in the cage, she was SO sad. I mean, not like Shadow's partial-sadness. Mariam was SOOOOO sad! It was horrible. She crammed back in the corner, put her head on the ground, with her paws "flattened" and she let out the most horrible, lonesone, "meows" I think I've ever heard. It was heartbreaking- these were the first things we heard Mariam say. I think Mariam thought Liz was coming back for her for good, and then it just broke her little heart to be back in the cage. Liz rushed off to clean her shirt, and I tried to console Mariam with petting through the cage, but to no avail. Her little spirit was crushed. :( Liz came back after a bit and Mariam actually perked up just a tiny bit. We felt a little encouraged. We said goodbye to Mariam and then went up to tell the workers about her underside bleeding. They were concerned about it and took her out of her cage right away and into surgery. By that point, it was past closing time, so we left for the evening. That news was so sad, to say the least. I had to keep my composure from crying right there and Liz cried some in the car. 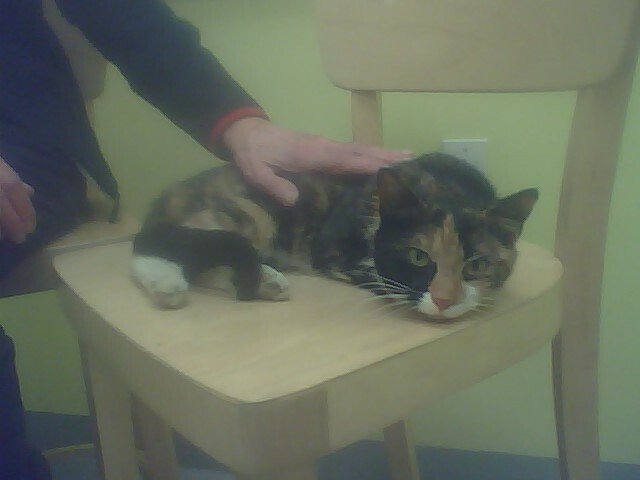 We hardly even knew this kitty, but had already seen and discussed her so much that there was an established relationship there that was suddenly cut off in the worst way. 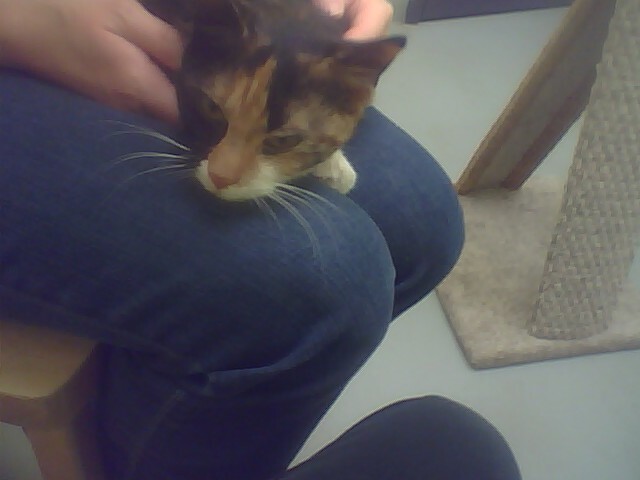 Mariam seemed like such a sweet cat that just needed and wanted some love. She probably didn't deserve to die at 7 months, but again, who am I to judge that? These things are so hard. Later today, Liz and I were discussing if we should have such emotion for cats and for Mariam. Children are dying every day of much worse things. Why aren't we more emotional about that? I think that's a valid question, and a hard one to answer. The point I argue is that I think a heart that is concerned for God's little creatures is heart that is able to be concerned for all His creatures, humans included. I think people that are mean towards cats and other animals, or just have no heart for them, likely have a hard time relating and being loving in the deepest way to humans. I think God's heart grieves for all His creation when these bad things happens. So, to grieve over little Mariam's short life, I think, is a good thing, because it shows that our heart is softened where it can be impacted by human life too. One verse that comes to mind is Matthew 18:4 - "Whoever then humbles himself as this child, he is the greatest in the kingdom of heaven."